The expression b^n is an exponential expression where b is the base and n is the exponent. Use the x^ (exponent key) when entering an exponential expression such as 2³, 2x³y³ and (a + b)³. 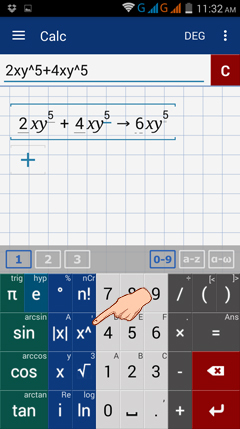 For example, to enter 6³, enter the base "6," tap the x^ key and input the exponent "3." If the base is made up of multiple terms, enclose it in parentheses before entering the exponent. Otherwise only the last digit or variable will be raised to the exponent. Type each expression as it appears in the problem. The variable y is found under the x key. You can enter it by tapping x​ twice.